Welcome! Today I’m going to share 5 legit ways to make money from home… With Disney! I’m not sure if I’ve ever mentioned it on this blog before, but I am a Disneyworld addict. Well, it’s not just DisneyWorld, our family also love the Universal parks in Florida too. The Wizarding World Of Harry Potter, in particular, is just beyond amazing. But if you have experienced it yourself, you’ll probably understand what I mean! I was fortunate to first go to Disneyworld in Florida for the first time, when I was 6 years old, (from the UK). It was really more than I could have anticipated, it was a childhood dream and created a lot of memories that stuck with me forever. I have been several more times to Florida since then and have been fortunate enough to take my own children too. When we go to Florida, we literally spend a whole two weeks in the parks and very little else. It’s really full on and I think I need a break just to get over it, never mind the jet lag. Actually, I’m sure I read in one of the guides that the average visitor to Disney World walks roughly 10 miles in a day…. 10 miles a day!! Well, I guess that is one way you’ll be working off all those delicious calories you’ll consume. Then there is the post-Disney blues. Yep, it’s a real thing. I can still feel slightly emotional when I think about being there and I last went over a year ago now! Once you’ve been, it appears you’re stuck with this ceaseless longing to return. (If you’re still hoping to get over it… Check out this post: top 5 ways to ease post Disney Depression – from wdwtravels.com). Anyway, to the original point to this post! My son recently decided that he’d love to go and work in Disney for a while when he’s old enough and while I was checking out their exchange program. It made me think about ways in which you can make money online, if you’re a massive Disney fan like me. So, I have compiled a list of 5 ways that you could make money with Disney online! Please let me know in the comments if you have any ideas, I’d love to hear from you! 1. Create Your Own Disney Niche Blog Or Website. The first way that I made money online, (aside from entering competitions/sweepstakes) was from creating a niche website. You can read about how to choose your blogging niche here. But I’ve seen plenty of blogs that are centred around Disney and once you set up your blog and generate a following, you can earn from your website in a variety of ways. This is by no means a quick route to riches, but with some effort and focus, you will be able to earn a supplementary income. If you’re very successful at it, you can potentially earn a lot more. One of the most popular ways to earn from a blog would be through affiliate marketing. I talk about that a lot on my own website because it’s one of the first ways I made money online and is the way that generates the most from my website currently. So, the way you make money via affiliate marketing is simply by recommending, or mentioning certain products and services on your blog via affiliate links or banners. If someone clicks through your link and purchases something, you can make a commission. You can apply to affiliate programs directly when you have your blog. In fact, it’s how I made my first sale online. Related post: My Ultimate Guide To A Money Making Blog! However, there are literally thousands upon thousands of affiliate programs out there are also plenty relating to Disney too. Walt Life – sends goodies every month to Disney Fans worldwide! Micky Monthly– Which also sends monthly goody boxes. Amazon– an easy-to-access affiliate program, that stocks plenty of Disney related products. Then of course you have the more travel based/ entertainment/information related affiliate programs. In these cases, you can earn a commission for customers purchasing a holiday, buy Theme Park tickets, or purchase a membership, for example. Florida Ticket Station – where customers can pick up tickets to Florida theme parks. I haven’t individually checked out all these programs, so be careful checking out all the T&C’s before you apply. If you’re looking for a large number of Disney blogs to see what sort of competition you’re up against, here is a list of 75 Disney blogs for you to check out. 2. Create A YouTube Channel – In The Disney Niche! If you’re not sure about starting a blog, (or even if you ARE) you could consider starting a Disney-related YouTube channel. People are desperate to search for hints, tips and tricks before they embark on their Disney experience and YouTube is now the nets second biggest search engine after google. That’s right, it’s a search engine! People are literally searching YouTube now in the way they would Google and there is still massive potential there as YouTube continues to grow. Having a YouTube channel can also help drive traffic to your website or blog, so they’re even more effective when used in combination. While YouTube itself is not very profitable unless you have a massive following, you can also earn more by using it as a way to drive traffic to your blog but also to boost affiliate earnings. You can also add affiliate links to the section below your YouTube videos and this is another way to boost your sales. Instead of directly posting an affiliate link, you could also direct people to your blog to read your full detailed post, or review of a product. YouTube is actually FAR LESS competitive than having a regular blog. Purely because, far more people are less keen on putting themselves out there on film. If you’re not bothered about being on camera, (or could get used to it) then it may be something to consider. You don’t even have to be in front of the camera to get on YouTube. You could also create screen only videos with a free software like screen-cast-o-matic. Also: Many people that are already on YouTube, do not make their videos SEO friendly, which is a terrible mistake. Making sure your videos are optimised for SEO, could make the difference between you being on the first page of the YouTube search, (or not being found at all!!). You can really niche down with your blog or channel too. For example; take this blog and YouTube channel about all things food related, (appropriately entitled DISNEY FOOD BLOG or DFB). It has nearly 64 thousand subscribers at the time of writing! For all around more general advice, tips, tricks and general info, you could check out the DIS UNPLUGGED vlog – which doesn’t have far of 90k subscribers. There are a lot of people seeking out information about Disney and this isn’t going to go away, making it a pretty evergreen niche! (Evergreen meaning that it has everlasting appeal!). 3. Make Money From The Disney Vault. I read about this via Money Magpie, and it struck me as a pretty simple way to make some additional cash with Disney. This is the term Disney uses to refer to their practice of restricting certain Disney film releases on DVD. You know when you see a Disney DVD for a while and then it completely disappears from existence? Well, they release a certain number of copies of a film and then take it off-sale for some years, before re-releasing it at a later date. While this can be annoying to some people who are unaware when these films are released, you can use this Disney practice to your advantage. For example; if you buy the film when it’s on general release, it’s not going to cost a huge amount. Most likely it will cost less than £25. If you then wait until it’s taken off-sale, you could end up selling a bluray for £40-£80, depending on a variety of factors, (such as whether it’s bluray/ 3D/2D/multi disc set etc). While regular DVDS did sell for a good return a while ago, it’s less usual now. Although the Bluray/DVD combo sets, which are still popular. The US does more combo-style sets than the UK does. For the best chance of a good return, you should also go for platinum or diamond additions. Also, make sure the film you’re buying is actually in the vault scheme, they aren’t all! Especially the most modern films, so double check that first. If you check out all your current Disney films and can’t see any in the vault, there are still ways you can easily sell your dvds. Music Magpie have a great service, where you can scan sell all your books, dvds, old phones/ipads/laptops and even Lego really easily. They have an app where you can scan barcodes of books and dvds, you tell them the condition of the item and they give you a price. You then simply pack up all your stuff in a box, (up to 500 items per box!) sort out a free courier to collect it and you will be paid on the SAME day that music magpie receives your order. Babble is a parenting blog that was bought by Disney in 2011. They hire independent writers out there to write for them, on a variety of topics. You can check out Audra’s post here, on the Horkey Handbook. Where she reveals how she got accepted on to Babble. It would appear that all Disney related jobs, including those on Babble, are advertised via their Disney Careers Page. So, if you keep an eye out there, you should see any Disney writing related posts put up there. If you already have a Disney blog, or YouTube going, this could really increase your chances for writing or working for Disney. It’s going to be a bonus if you can demonstrate passion and knowledge for the Disney brand. 5. Become a Disney Travel Consultant. Some Disney vacation package websites, offer work at home opportunities selling vacations to Disney. These sites are authorised and registered travel agents. If you are hired, you will be able to earn a percentage of the sale. From what I gather, it’s likely a commission only basis. You may have to pay a set up fee and additional fees, in order to sign up. But this will depends on the company. Generally, you won’t need travel agent experience. What they’re really looking for, is a strong knowledge of Disney, (and the resorts). Some require you to have been on a Disney cruise, to have been to Disney a certain number of times, or to have been on a Disney vacation within the last couple of years, (for example). If you’re a massive Disney fan, have an excellent knowledge for all things Disney and the passion to match – then this may be something that would interest you. It may be that you have to be a resident of the USA to take these positions, (even though they’re homebased). But you may want to check. Here are a list of companies you could check out. (Please bare in mind, I have not researched each individual company, so you will want to check them out before you sign up!). – Cupcake Castles Travel Company. So, there we have it! 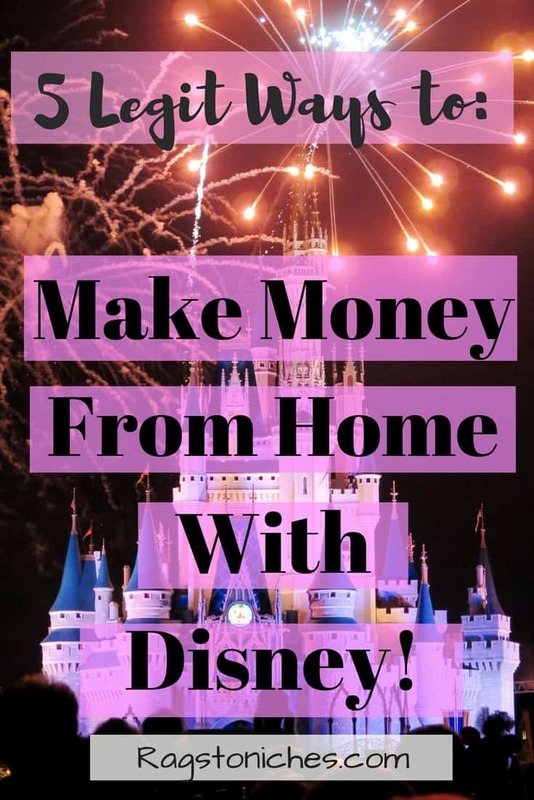 5 legit ways that you could make money from home, with Disney! Do you have any other suggestions that I haven’t mentioned? Don’t be shy…. leave a comment in the section below! Need Help Making Money With Disney? If you’d like to have any help and guidance getting started with the Disney niche, I can recommend this platform! You don’t have to stick to the Disney niche though, there is training you can use towards making money within any niche of your choice. Also, if you’re interested in blogging – don’t forget to check out my step-by-step guide here! I love your site… you have wonderful for knowledge of getting involved with Disney! Disney is my childhood and it’s a dream job to be able to help assist one of the most magical places on the planet. I enjoyed reading about making youtube videos for Disney, as that would most likely be something I would be involved in. This is great, thank you so much for this! Hey Ryan, pleased you enjoyed the post and thank you! I love Disney fairy tales such as Cinderella, Tangled, Beauty and The Beast etc. Do you think I can have an affiliate site on just Disney Fairy tales? and review the fairy tale figurines, how to meet fairy tale characters at Disneyworld and so on ? Hi Ravi – sorry forgot to get your comment published. We are talking via message now anyway, so will respond again to you there. Thanks for stopping by! What wonderful ideas! I think everyone’s childhood dream starts with Disney. What a wonderful way to produce an income that brings up so many memories from when you were a kid. My favorites were Cinderella and Pocahontas. I used to have almost every Disney movie on VHS. I would watch it all o the time and play dress up with my friends. I would have never thought of starting a blog or creating YouTube videos in this area. This is a great inspiration. Hey Staci, thanks for the comment. I’m pleased that you liked them. Good luck!